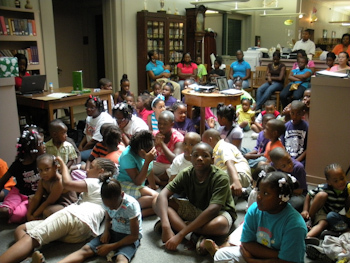 I had a great time this morning with the Summer Reading kids in Port Gibson at the Harriet Person Memorial Library. 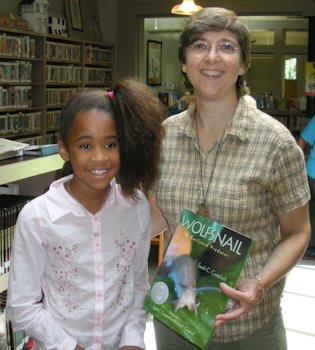 We had a large group with a big age-range and lots of wide eyes as I talked about the wolfsnail. There were some in the audience who heard me last summer when I visited A.W. 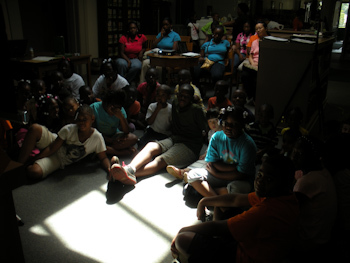 Watson Elementary School. 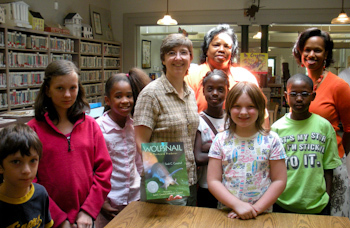 The kids had fabulous questions — including ones about how books are put together. 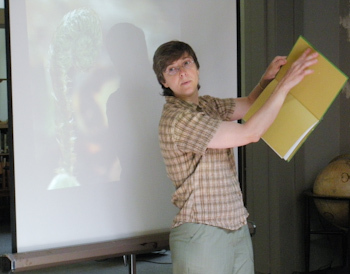 In this photo, I am telling them that the end papers are glued to the book’s cover. This photo was taken with my new point-and-shoot. Helen McComb took it for me. She was very helpful with all of my equipment. There were definitely challenges in the photography department. There was a lot of natural light — from a skylight. This led the camera to believe there was enough light that it didn’t need the flash. You can see what the bright sunlight did to this photo. Helen knew how to override the flash so she did that for this photo. When Deborah Peterkin, the assistant librarian, said the librarians were going to place names of summer readers into a box and pull a winner’s name for prizes, I decided to donate a book. If you’ll remember from yesterday, I had planned on shooting video, too, with my new Sony webbie HD. However, it malfunctioned. It did OK in the short test I shot before the kids started coming in, but went to sleep while we were waiting to begin. When Helen tried to wake it up to get it going, it wouldn’t shoot — displaying a formatting error. I was able to reformat the memory stick when I got back home, but I was not happy about the malfunction. I’ll try to use it again soon. 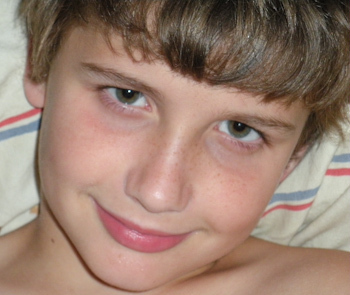 Does this look like a kid who several hours later would wake up with a bad earache? Poor guy. He’s got a touch of swimmer’s ear and a touch of something else in his throat and sinuses. He’s bummed because he can’t go to the pool for a few days — and it’s 97 degrees outside — but we found out our pool is going to be closed anyway for a much-needed cleaning. C’est la vie! I have never seen the library so full. Wow! That crowd is amazing.